Takes 15-30 minutes , serves 1-2. Use a food processor or food chopper to mince vegetables available in fridge or freezer. Mince until extra fine in texture. Heat pan with olive oil to medium high heat. Saute vegetables until cooked through. Season with salt, pepper and garlic powder. Spread refried beans on one side of a tortilla, top with cooked vegetables and sprinkle with cheese. Top with second tortilla and place back in pan until hot. Tortilla may golden and cheese should melt. 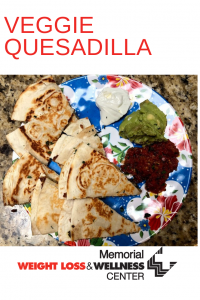 Serve with your favorite quesadilla toppings.